The St. Moritz resort in Switzerland conjures up a vision of outdoor pursuits such as skiing, snowboarding and walking. However, for those coming from Ireland it is off the beaten track to get there. The best way to travel is to fly to Zurich and get the train from there. This takes about 3 hours. It whisks you along the tracks at a good pace but still slow enough to enjoy the vistas. However, when you change trains at Chur and get on the Rhaetian Railway Chur to Albula line that’s when the journey becomes a unique experience. Be sure and have your nap on the first leg as you won’t want to miss a second from here on. The train meanders along at a sedate pace as it climbs through the mountains with every twist and turn a picture postcard vision. The Abula line has UNESCO World Heritage recognition and is considered to be ‘universally outstanding’. 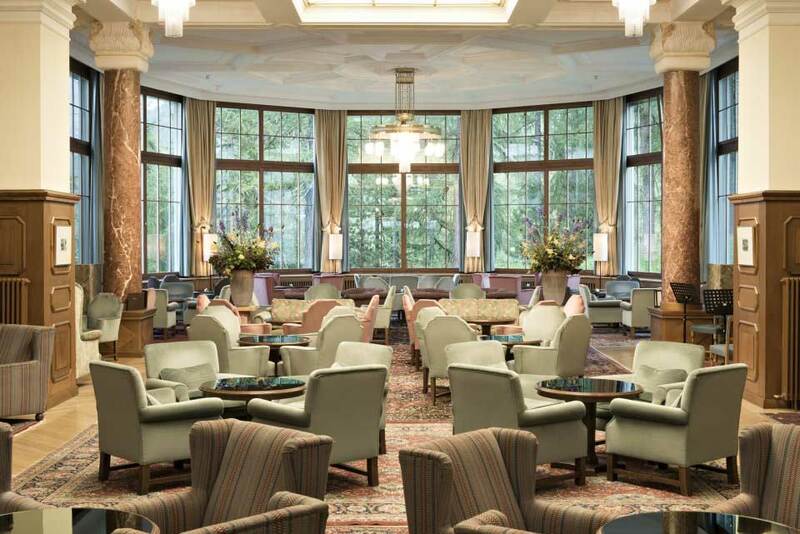 As the train pulls in at St. Moritz be sure and put your best foot forward as the Waldhaus Hotel sends a driver to collect you at the station. The Hotel Waldhaus is a 5 star hotel situated about 7 miles from St. Moritz (about 15 minutes drive) and sits snugly into the side of a mountain about 50 metres uphill from the nearby village of Sils-Maria. In my case I felt that I was back in time and found myself looking around to see if Audrey Hepburn was anywhere in sight. All I was missing was the fur coat and Chanel sun glasses. 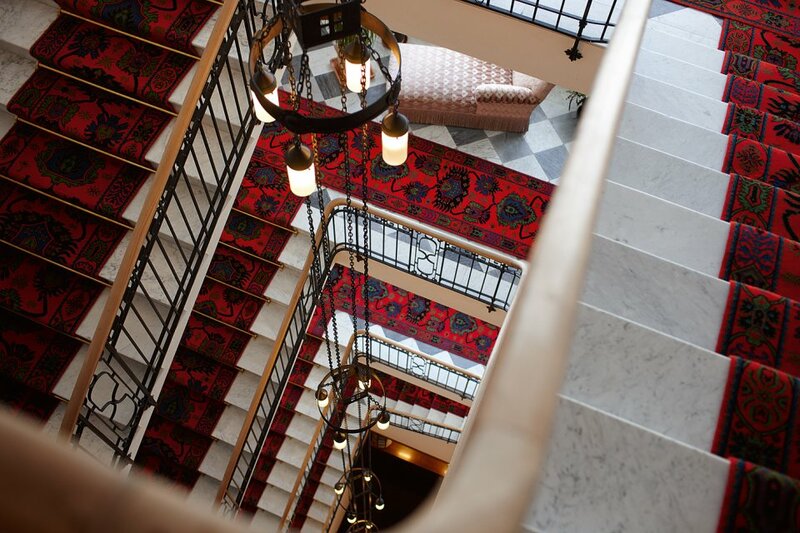 The hotel dates back to 1908 and from the moment it comes into view it radiates the wow factor. From the front door it oozes genuine charm and vibrancy. Entering the front hall I was immediately struck, not by a glitzy hotel with overmatched fabrics and sterile flower arrangements, but by an authentic warm atmosphere. The hotel is family owned and run by the Deitrich-Kienberger family since its inception in 1908. The fifth generation is now already working there. There are 140 bedrooms in the Waldhaus Hotel, and no nasty extensions have been added to the original hotel. 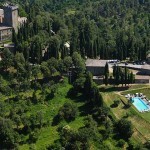 Their ethos is to enhance the old rather than replace it and by keeping the hotel to its original 140 bedrooms they are genuinely able to care for all their guests; so much so that their celebrity guest list reads like a ‘Who’s Who’ and ‘real celebrities’ such as Marc Chagall and Albert Einstein were regulars. I was whisked to my bedroom on the second floor in one of those tiny European lifts that cannot fit you and your luggage at the same time. My luggage miraculously arrived at the same time. However, this was the only tiny thing about this magnificent old hotel. Everything else is on a grand scale. The hotel corridors are at least 10 feet wide and the bedrooms have little mats outside the door for guests to leave their outdoor shoes. This is a nice touch and very practical as it means that the carpets are perfectly clean in the bedrooms. 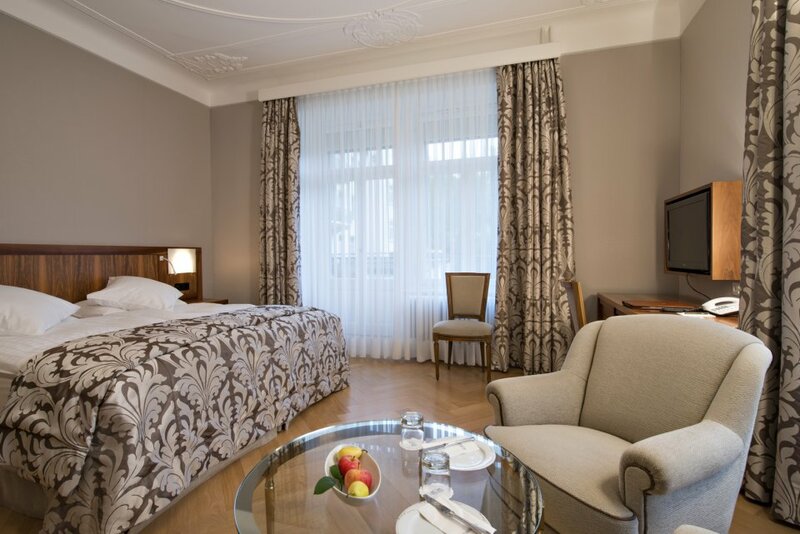 The rooms have those old fashioned high ceilings and big double glazed windows. Every room has a view, be it of the lake or mountain and be it north, south, east or west. There are views of Lakes Sils and Silvaplana and of course the fascinating valley of Fez. As each room has a unique view and décor the biggest decision is whether to have a room with a view of a lake or a mountain. Heading downstairs via the graciously curved staircase, the only thing missing was the swish of a satin evening dress. The Great Lounge is a massive airy room with a high ceiling, filled with really comfortable armchairs. It is an ideal place to enjoy a peaceful read of the newspaper or a good book. Another choice awaits whether to sit in a quiet corner or right in the middle of the action. Classical salon music is provided by a trio of musicians who play every afternoon. Succulent macaroons and scones with proper green tea are just some of the choices from an extensive menu. My tea came in a little tent concoction and I felt very virtuous by sitting so genteelly in the Lounge and ignoring the wonderful clubby Bar with its big comfy leather chairs. That treat would come later after dinner. Out of the corner of my eye I spotted other rooms to relax in such as the Empire Room, a gracious room where regular concerts are held during the summer and The Reading Room, whose windows make it appear to nestle in the middle of forest trees. Dinner is served in the dining room in the Arvenstube Restaurant, which is sumptuous dining room with majestically high ceilings; however, it manages to convey a cosy feeling due to the wooden paneled walls throughout. If a less formal meal is desired then stop en route in a side room off the Grand Lounge, which is referred to as the ‘in between bite’. The romantic Outdoor Terrace is only open during the summer season. The extensive menu is devised by the Executive Chef, Kurt Roosli, who has been there since 1965. When the hotel is closed he regularly visits other chefs in London, Tuscany among other places. His team comprises 21 young chefs who share his ethos for cooking as a ‘Labor of Love’ which is the title for his cookbook. The menus are extensive and provide something to suit even the fussiest guest and the cuisine is of the highest standard that I have experienced in any hotel anywhere. Dinner was followed by that well deserved whiskey digestif in the fabulous bar. The bar has all the requisite up to date facilities but everything is beautifully presented in a bygone style with big leather armchairs. I was now firmly ensconced in a Hercule Poirot episode! That evening there was some soft live music and several couples took to the floor dancing perfect waltzes. In continental Europe it is expected that everybody should be able to dance so therefore they do so without any embarrassment – probably because they can dance properly! Following a wonderful night’s sleep, in a bed that I would have packed in my case and taken home with me if I had room for it, I was ready for action and to take in the pure Swiss air. After a hike back across the lake some indoor relaxation was called for. The Waldhaus has an indoor swimming pool; sauna and steam rooms and small exercise room, which is just the ticket to get rid of any stiffness from a long walk. The swimming pool measures 66 x 26 ft and is therefore much bigger than some hotel swimming pools. These facilities are accessed via a window bridge to a new building at the side of the main hotel and therefore remain separate and yet part of the hotel. It is what it was intended to be – a facility for guests but not the main reason for staying in the hotel. The only sad part of staying in the Waldhaus is the struggle (and it was one) to leave. 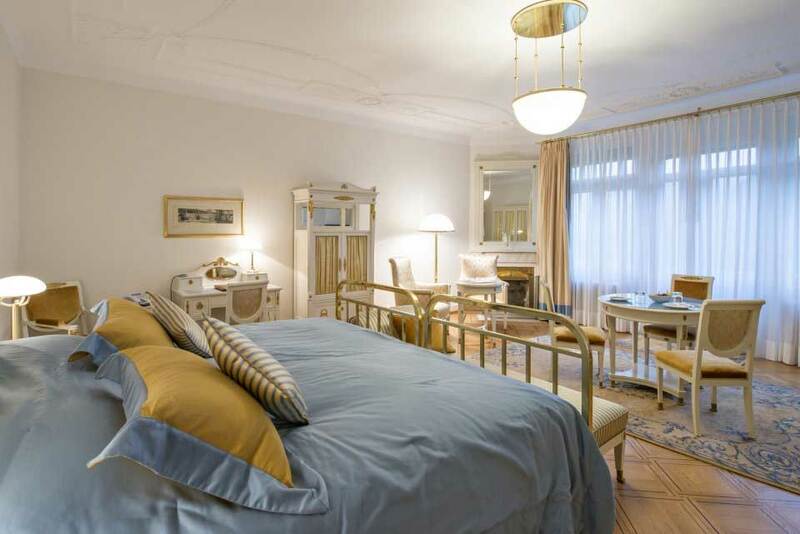 It is not surprising that most guests opt for 5 day or week long stays as there is so much to do and see and I didn’t even mention those gorgeous boutique shops in St. Moritz itself. The Waldhaus Hotel offers guests who stay more than 10 days good discounts, and this applies to those who come several times a year. The Waldhaus has very extensive summer and winter programmes. Every season is catered for such as an Advent and New Year’s Ball in December each year; ski safaris are from January to April. The Waldhaus Hotel is situated on Via da Fex 3, CH-7514 Sils-Maria, Switzerland.